By '73 Sondheim was Bway's acknowledged genius--elevating the musical past its Golden Age stumbles; charging thru the '70s like a house afire, winning Tonys each time at bat--so revered by the culterati but lacking the mass appeal of R&H or Lerner & Loewe. In part this was a matter of timing; the zeitgeist had shifted in a whole new youthquake; and Sondheim pushed the musical into more adult, more challenging, more niche territory. New talents were barely applying: about the only other freshly dedicated Bway composer was Stephen Schwartz (whose first 3 shows all ran longer than any Sondheim musical). Still, whether by talent or default, Sondheim was the King of the Street. And so a pair of young impressarios feeling a coronation was due, took over the Shubert Theater (where A Little Night Music had barely opened a month prior) for a star-studded, evening-long career tribute to the man whose career wasn't yet at mid-point. But the boys (Craig Zadan & Neil Meron) who smartly put the evening together--and even more smartly had it recorded--were launched as producers, who over the next 30+ years brought more Bway musicals to the screen & television than any other outfit. Their concert was held three months before I returned to NY for my fourth summer, this time to stay for good. 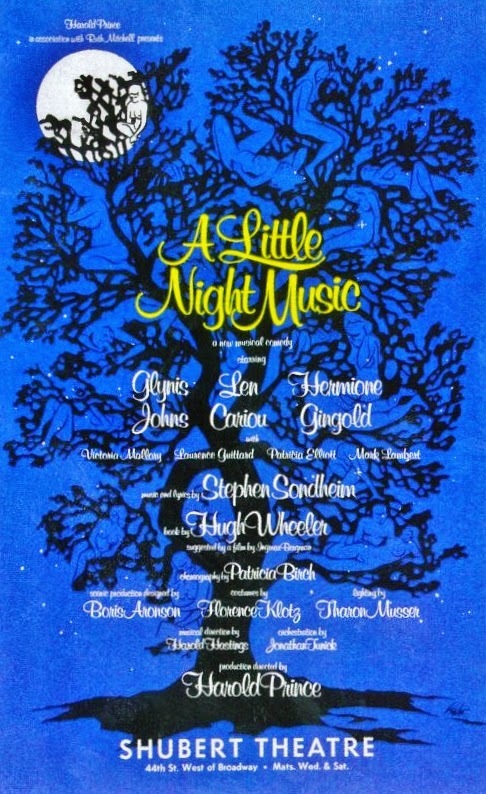 As usual I'd followed the Bway season from afar, which started out packed with new musicals--Galt MacDermot had no less than two gigantic spectacles, both of which crashed & burned--but by June only a handful remained: Pippin, Seesaw, Debbie Reynolds in Irene, and the Tony winner, A Little Night Music. There were pleasures in each of them, but nothing that set my heart aflutter. Least of all the latter. Show Boat, Carousel, My Fair Lady, Follies--these are what Ethan Mordden calls Favorite Musicals--favored by intelligent, stimulated, longtime theatregoers. To this list he adds A Little Night Music. Sophisticated, civilized, heady, enchanting, effervescent are said to be the show's lingua franca. It's Dom Perignon, said Clive Barnes. Alas, I find it's more like flat ginger ale. Night Music was a redirect from the play Prince & Sondheim wanted to adapt: Jean Anouilh's Ring Round the Moon. 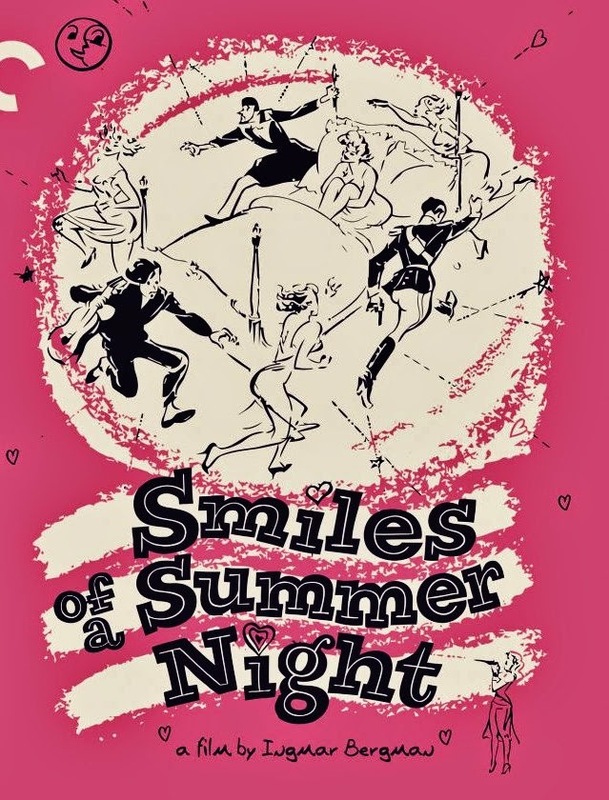 But after twice being refused the rights, they turned to Ingmar Bergman's early film, Smiles of a Summer Night--a comedy that illicits more smiles than laughs. Hugh Wheeler's Bway libretto has its share of witty lines, but there's little here to tickle the funny bone. It's a light operetta, really, no less and no more. It has proven to be often performed (thought to be the more accessible Sondheim score partly hood-winked by the fact of "Send in the Clowns") but do people really connect with it emotionally? I simply can't. Yet as with almost any music, repetitive listening can tear away resistance. 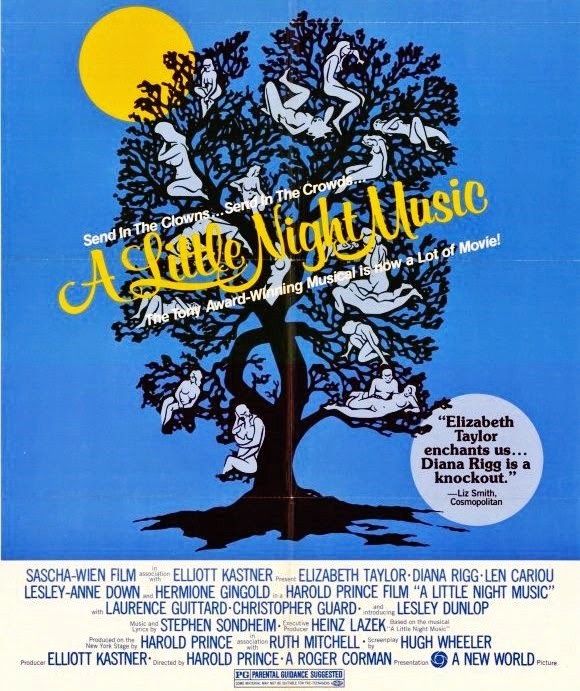 Of course I recognize Sondheim's musicianship as well as his poetry, and as always happens during my study of each film, the score takes my cortex hostage and the tunes rattle around day & night. Night Music might be "sophisticated" but none of it moves me or makes me feel happy. It was the fresh Tony winner the year I moved to NY; and the third triumph in a row for the Sondheim-Prince consortium. Reviews were rapturous and I awaited the OCR eagerly in California before summer took me back to Bway. So much was written in particular about Glynis Johns' 11 o'clock number, that I expected the moon, or at least "Losing My Mind." It was such a colossal disappoitment, that to this day there are few acclaimed theater songs I dislike as much as "Send in the Clowns. " I can only rationalize its popularity in that the lyric is poignant enuf to forgive a mopey melody. But this being the best known song in the entire Sondheim catalog is utterly baffling (even Sondheim finds its popularity a mystery). It's not even the best song in Night Music. That would be the peripatetic "A Weekend in the Country," less a song than a confluence of story threads, brilliantly built to a choral climax. Aside from this, the show tho occasionally lively in spirit, refuses to give in to frivolity. The songs are all blunt and/or glum self-defining statements, tinged with a Nordic darkness ("Every Day a Little Death", the misogynistic "In Praise of Women," etc.) that get awfully tiresome. "Liaisons" is so soporific the character who sings it falls asleep on its final notes. There's no "June is Bustin' Out All Over" or a "Get Me to the Church on Time," or a "Big D" to rouse the show from its slumber. That it's all variations in waltz time is more academic than rewarding. Sondheim's lyrics are nearly peerless, but I can't entirely warm up to his melodic sensibility. To compare his waltzes to Rodgers' is to lessen them further. Pauline Kael wondered if people really enjoyed Sondheim's "sour sentimentality." I rode the critical bandwagon thru Company and Follies, but from this point forward his were never musicals I liked to listen to with any frequency. More homework than pleasure. Nor did the original Bway production wow me as I thought it might once I got into the Shubert. 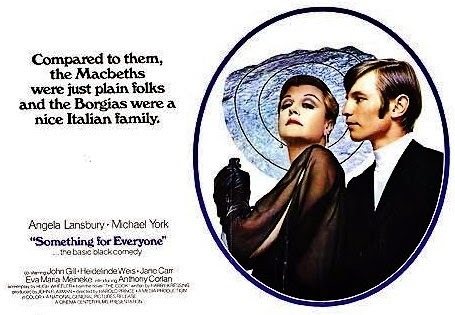 in which a bi-sexual Michael York worms his way into a castle-owning family, rising to baron of the manse. Angela Lansbury played an elegant baroness; the Alpine setting was gorgeous and the story was intriguing. It was a minor art-house hit; a one-off detour for Prince right before starting Company. Seven years later, with a hole in his schedule Prince envisioned Night Music for the screen. Sondheim thought it bad idea, and suggests in his memoir that Hal may have pursued it because he wasn't creatively fulfilled from the show. Not like Sondheim was--designing a score of whole cloth, based around a theme and variations. A lover of puzzles, Sondheim was inspired by the challenge; given license to show off his technical dexterity and, as always, his verbal brilliance. Qualities that Sondheim felt were problematic, possibly detrimental to the conception of a Night Music movie. Nonetheless, Prince prevailed and Sondheim assisted in preparing and amending his score, including two new songs. brought such indelible presence to previous musicals The Music Man and Gigi, but here, despite her prominent billing she has far less to work with. Tho hats off to her for persuing the role at age 75, despite being, in the minds of the creators, all wrong for it. But even Angela Lansbury couldn't make anything special out of it in the 2009 revival; tho her successor, Elaine Stritch, did better by playing not Madame Armfeldt but herself. Surprisingly, Desiree hasn't turned into another Big Lady musical role, the kind that has any & every no-longer-prime actress taking it on. But it's a part that requires some true finesse--something that Catherine Zeta-Jones (despite her Tony award) lacked in 2009. Glynis Johns had more of it than I realized--tho I tempered my enjoyment of her knowing she'd trumped Tammy Grimes for the role. Glenn Close had been mentioned for ages in a revival, but it was Bernadette Peters who at last graced Bway in the role--one finally suitable to her age and voice. but a Mittleuropean stage actress is not a movie star. And Liz, with her baby-doll voice and sloppy carriage is utterly unconvincing for a practiced stage veteran. It's hard to guess the intent of her scenes as Camille and in some Restoration comedy. Are we supposed to think she's a great actress or is her mid-range talent meant to be the point? When she's offstage this Desiree is mostly just as artificial. Taylor's singing is pathetic, she flounces about in her few moments of dancing; and she reads Hugh Wheeler's lines as if she was acting in a play. Prince did little to distinguish the film from its stage origins; the movie's posters were nearly a copy of Bway's two-sheets; only the nudes in the tree made prominent where once they were subtle. Released by New World, an indie film company started in 1970 by B-movie mogul, Roger Corman, Night Music opened without fanfare in NY on March 8, 1978, in an Upper East Side art house, the Columbia. It lasted all of four weeks before it was pulled and played out in the nabes. Neither word of mouth, nor my own ambivalent feelings about the show drew me to see the movie, and it would be 30 years before I got around to it. The trajectory of my life was forever altered by an article in The NYTimes on November 4, 1977. A new Friday column of Bway news reported that producer Saint Subber (my first theatrical employer) was moving to San Francisco with big plans to start a West Coast production company and produce new plays. In the two years since he closed his NY office, and set me on a downward spiral thru the greasepaint jungle, I had been reduced to working in syndicated radio--duplicating and shipping program tapes--perhaps the dullest job I'd ever had. On top of my recent vacation in California, this seemed an opportunity fated in my direction, and I immediately sat down and wrote Saint another impassioned letter explaining why he had to take me with him. Upon pestering him further in person, he capitulated and we set a date in March for me to report to his new home/office in SF. As of Nov. 14, my NY days were numbered. Naturally my life got more complicated and intense as the clock began ticking. For one thing I was leaving behind friends (Bill, Laura) who'd followed me East from California--and would stay for decades longer than I. Not to mention the many new ones I'd made, mostly within the last two years. And of course, Baba--still up in her tenament apartment on 141st St; now 77 years old, and still caring for her feeble sister and Uncle Festerish boarder. But apparently my ambition trumped any such considerations, even my improbable flame-hot affair with a woman 8 years my senior, which began on New Years Day and foolishly flamed so close to my departure, taking on enuf emotional heft to fill a Russian novel. That winter was one of the snowiest on record. But I was out on the streets, drinking with friends, standing for hours in line to see Julia, The Turning Point, Close Encounters of the Third Kind; walking a deserted Fifth Ave on Xmas eve with the Abel twins: Heddie & Margot. And then in the New Year lost in an unfamiliar psychosexual universe in an apartment on 104th St. And still finding time to broaden my cultural studies. Hard to believe this was when I discovered Shanghai Express, Casablanca, Now Voyager and The Wages of Fear. On the other hand, I had never watched less TV; tho I did find Ernie Kovacs then being re-discovered by PBS; and the peerless gang from SCTV--a troupe infinitely funnier and more clever, to me, than the concurrent Saturday Night Live, with its much lauded original cast. My fifth and final Bway season (1977-78) offered little argument for my staying in New York. The Gin Game and Dracula were the big hits that fall, but my funds were severely limited and neither really drew me. Revivals of my least favorite musicals: Man of La Mancha and Jesus Christ Superstar (shows I'd seen on Bway in their original runs--and I was still just 25) provided little competition to the fall's only new tuner: The Act; one of Kander & Ebb's lesser efforts, but an evening with Liza nonetheless. More experimental shows piqued my interest: For Colored Girls Who Have Considered Suicide/ When the Rainbow Is Enuf; a self-proclaimed "choreopoem" and Miss Margarida's Way, a hilarious harangue from a fascistic teacher, played to perfection by Estelle Parsons. It was such fun at the Public, I took Laura to see it once it moved to Bway. And then when I had nearly lost all faith in my old time religion along came the very same Harold Prince--in retreat from the cameras--pulling along a great big, dazzling, loco-motive, propulsive musical comedy: the Deco-themed On the 20th Century (this is the show I'd have preferred to assist Prince on). I made sure to catch the first preview at the St. James on Feb 13; and caught that rare flush of "Bway" excitement when something truly wonderful is first revealed. I'll never foget Tommy Tune's bouyant face, as he rushed up the aisle at intermission. I immediately bought tix for after Opening and took Bill; and then waited agonizing weeks adrift in SF for the album to come out. It sure felt like a parting gift to me from Bway. Our divorce was validated later when the Tony Award was granted to a mere revue, Ain't Misbehavin' and not the more nuanced, crafted and perfected musical comedy that was 20th Century. But the cultural mood wasn't rolling with a Deco-flavored operetta, as Bway continued to lose whatever cachet it once held in the national conversation. My Bway--the one I'd grown up on--was now already history. Film was where it was at. Whatsmore I had plenty of ideas for movies, but was curiously deficient in concepts for musicals--outside of adapting movies such as Some Like it Hot (which was obvious, and happened) and The Producers, which a campy show queen friend from the Cherry Lane, and I, spent a few months hopelessly tinkering with; naively thinking we might somehow get to produce it. (Obviously we weren't wrong as Mel Brooks himself proved decades later). But I had already decided if I wasn't going to be the next David Merrick, then I wanted to be the next Billy Wilder. I had a roster of movies already kicking around my head--including a Nashville-style panorama on the mounting of a Bway musical, from the top talent to the cellist in the orchestra. Film captured something for permanance. Theater was back-breaking work that evaporated but for the memories of those who participated. Not that there's anything wrong with that; after all I still had some stake in it, joining Saint in his West Coast ventures. But also, my musical taste was broadening beyond Bway. So much of my alternative sampling came from Bill's introduction--but we had very similar taste in music. (He liked much the same Bway scores I introduced to him.) We lived on music then and '77 was filled with Jefferson Starship, Santana, Cass Elliot, Spanky & Our Gang, Bette Midler's Songs for the New Depression (by far her best album ever) and The Beatles, which I was finally catching up on with any serious attention. My MOMA membership had fired me to pick up brush & canvas again, and I enjoyed near a dozen paintings (some of which I still have hanging) over '76 and '77. Sadly, I've not done as many since. I was 26 years old and everything was happening to me, creatively, socially, sexually. But three days before A Little Night Music opened, I hopped a plane to San Francisco, leaving a life-in-progress behind. Send in the clowns. "Love Takes Time" rewrite of "Sun Won't Set"
Standout Number: "A Weekend in the Country"